Opportunities to display your marketing message at an event or your location should be fully taken advantage of. Since your time will likely be filled up with talking to potential customers, getting passersby attention is critical. Many people may not have time to stop at your booth, so presenting your message to them via your photo booth advertising will bring in leads you likely would have never received. Don't let them walk by! Adding interstitial ads to your slideshow will help get your marketing message out or introduce your sponsors to your potential customers. Choose to have your marketing messages displayed as an image ad or video. 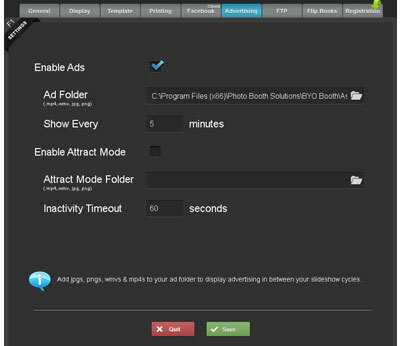 These display ads will be displayed at timed intervals on a loop so new passersby will see your message. 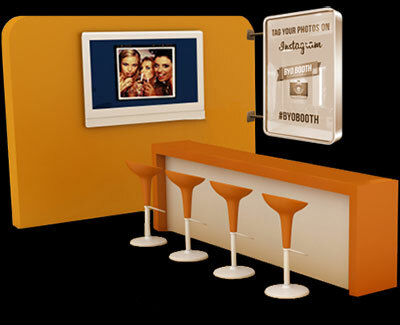 Photo booth advertising with BYO Booth is an easy and effective way to communicate your messsage with potential customers. 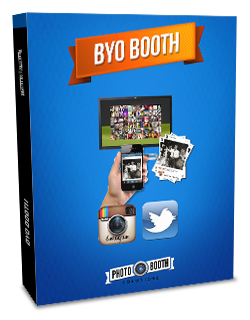 BYO Booth is a leading photo booth software that is easy to use and contains a full array of features. From hashtag printing to commercial photo booth advertising. So many creative ways to attract visitors attention and keep them engaged. Download a free trial today to find out for yourself! Click the links below to get started with display advertising and more today. Free trial to try all the amazing features!